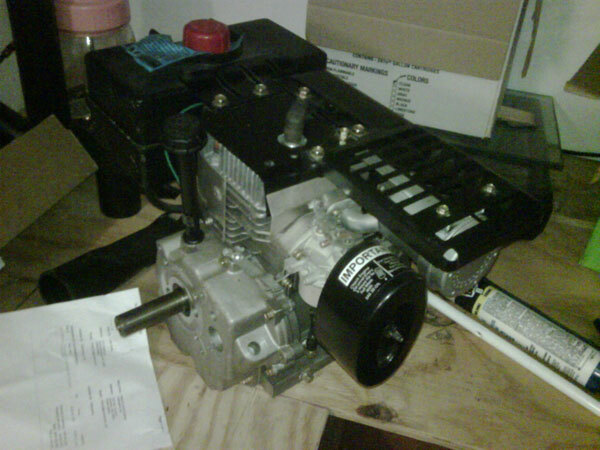 I purchased my cycle kart engine from an online vendor that said it sat on a shelf for several years. It had never been started, but I was still a little nervous that it would fire up. It started on the fifth pull and ran well, although I did adjust it to idle a little faster. As my frame is no where near completion, I mounted it on 28″ long 2X4 boards for testing. I let it run for a while to get warm before giving it full throttle. I weigh 210 lbs and was standing on the boards and couldn’t keep the engine still when I gave it full power. I’m very excited to get moving with my build, but still need to find somewhere that still has a TAV2 for sale.